"If I'd known I was going to do this race, I would have trained for it." That was my standard joke today. 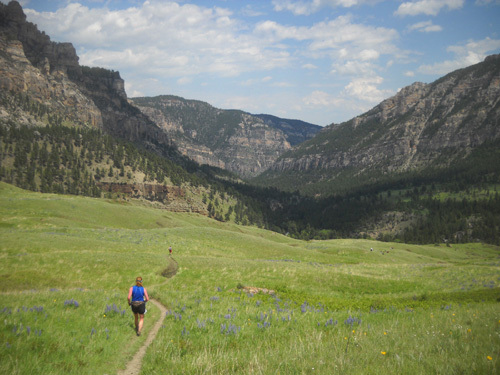 I mentioned in a previous journal entry how I decided to enter the 30K Bighorn race only a few days ago after getting inspired on our hike through the Tongue River Canyon. Because of my deteriorating knees (bone on bone in both) I haven't participated in any race for almost two years. Fortunately, that impulsive decision turned out OK. Despite not being fully trained for the distance I finished the course (and a bonus mile before the start) and had a great time. "Great time" as in fun, not how long it took me. Jim finished, too, in a much faster time than me but with more pain because of his injured knee. I'm pretty sure I had more fun out there than he did. Let's get this show on the road! 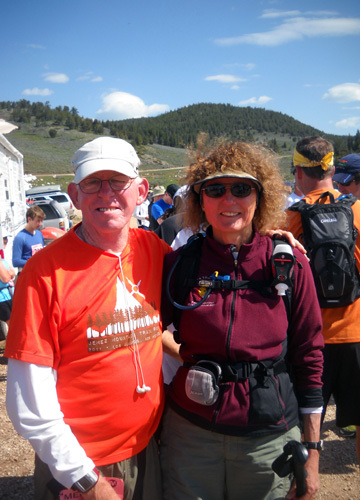 Jim and me at Dry Fork before the start. Neither one of us was certain we'd finish so getting to the park in Dayton on our own two feet was victory in itself. 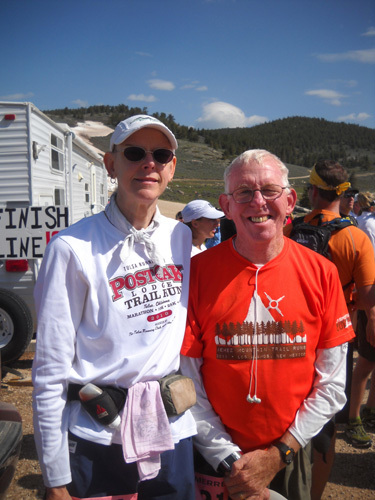 Times sure have changed from when we were both able to finish 100-mile trail runs, though. After the race we agreed that this 30K felt more like 50 miles. There, that's the executive summary. 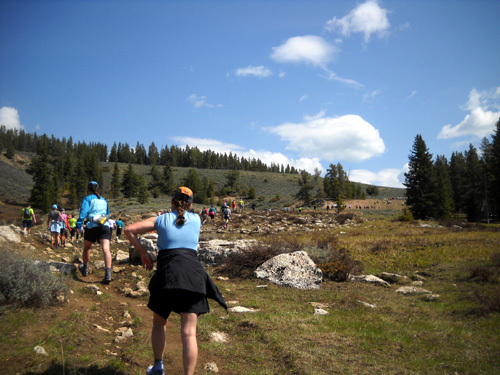 Read on for tales from the trail and lots of photos from the last 18 miles of the Bighorn course. 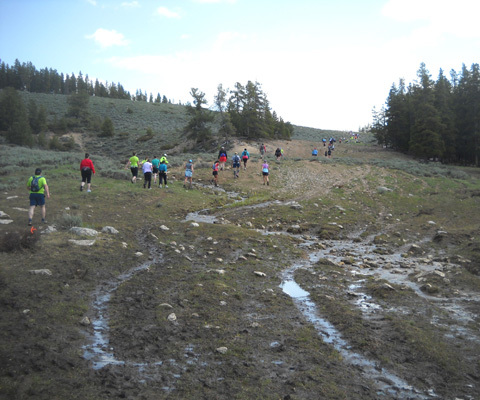 Everyone in the 50K, 50-miler, and 100-miler who finished their race also ran and/or walked this section. 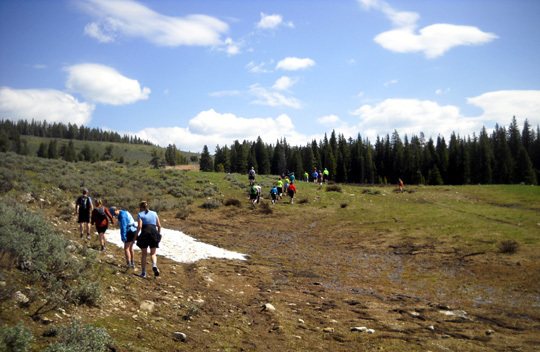 One of the best things about the Bighorn 30K is its civil start time at 10 AM. That doesn't mean we could sleep late, though. The 50-milers had to catch their buses in Scott Park at 4 this morning for their 6 AM start, and the 50K runners left (or were supposed to leave) the park at 6 AM for their 8 AM start. Since there are so many 30K runners (over 300 this year) and very limited parking in Scott Park, the buses for the "short race" leave from the high school at 8 AM on the west side of Dayton, about 6/10ths of a mile from the park and our campground. 30Kers hike up Freeze Out Road from Dry Fork; you can see Twin Buttes in the background. That still meant Jim and I needed to get up about 6 AM to get ourselves and Cody ready, then walk to the high school to catch one of the buses to Dry Fork. The other option was less pleasant -- leave our truck at the high school and retrieve it after the race, when we'd be tired. No thanks. We'd rather get a warm-up walk before the race. I suppose we could have bummed a ride to the high school with someone but we didn't even try. The temperature was in the low 50s F. when we got up and the sun was already shining. We're in the north and we're close to the longest day of light. Temperatures were in the mid- to upper-70s F. in the afternoon when we passed through the Tongue River Canyon and along the road back to Dayton. Those are usually the hottest parts of the course. in the 50K and 100-miler coming up FSR 149 to the Dry Fork Aid Station. 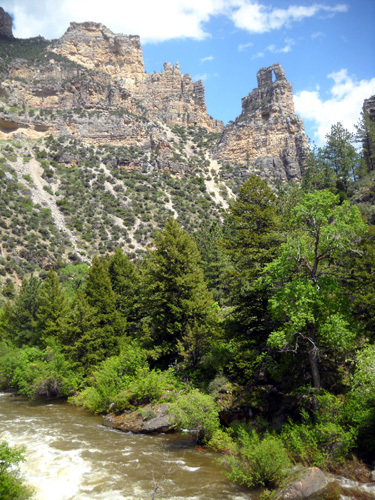 The day remained mostly sunny with enough of a breeze to get some relief through the canyon and on the river road for those of us who passed that way during the afternoon. Cody was disappointed that he didn't get to go with us today. He knows all the nonverbal signs that say "We're going to go run" but all he heard us say out loud was "You have to stay here." He looked pretty sad when we said goodbye and left him in the camper. He did fine, as usual. He's pretty low maintenance. When I was outside the camper with Cody this morning I noted that the three 50K buses didn't leave Scott Park until 6:20 AM. They almost always leave promptly at 6. That didn't portend well for the 8 AM bus departure for the 30K folks -- we'd be riding on the same buses. 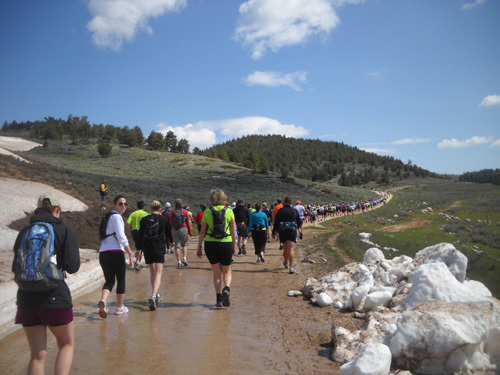 It takes more than an hour to get up to Dry Fork in the buses, another hour to get back down to Dayton, plus the time it takes to unload everyone at Dry Fork and get the buses turned around in tight quarters near the aid station. We figured we didn't have to hustle to get to the high school as early as we'd planned. However, we did leave early enough to get there before 8 AM. Jim and I wait at the high school for more buses to arrive. We should have gone earlier. Two extra buses for the 30K runners were already there and full. To our surprise they did not leave for Dry Fork but waited on the other three buses to come back down to transport the remaining 30K runners en mass. So we stood around with Anne Watts from 7:45 to 8:45 waiting for the other three buses to arrive. The good thing was having more time to talk with Anne. The bad thing was being on our feet, then sitting, on hard concrete for so long. A little comic relief once we were on a bus. Then we saw the buses coming. Yay!!! Oh, no. They didn't stop! It was excruciating to watch those three buses continue past the school to Scott Park, perhaps to return some 100-mile runners who dropped out along the course? Finally the buses came back and we were able to sit down on relatively soft seats for the next hour. Anne and I snagged the seat behind the driver of the fourth bus; Jim shared the other front seat with two small trash cans for banana peels, empty water bottles, etc. 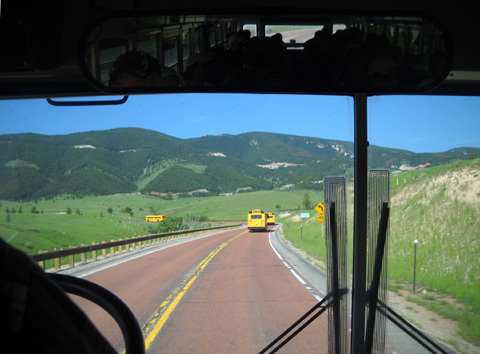 Heading toward the Bighorn Range in the bus. Being in the front assured me of getting some pictures AND being able to back-seat drive if the bus driver, Dan, looked like he would miss the turn on FSR 15 to Dry Fork. Several drivers have missed that turn over the years, occasionally forcing the 30K or 50K to start late and causing angst for the runners on board. Fortunately, the 30K buses all made the turn properly this year. We enjoyed the ride and the time with Anne. She's always full of interesting stories about her and Matt's running adventures. Or as Jim quipped, "It's all about Sue." Our bus was fourth of five going up to Dry Fork so we figured we'd have to wait a while to check in and go to one of the porta-potties when we arrived. 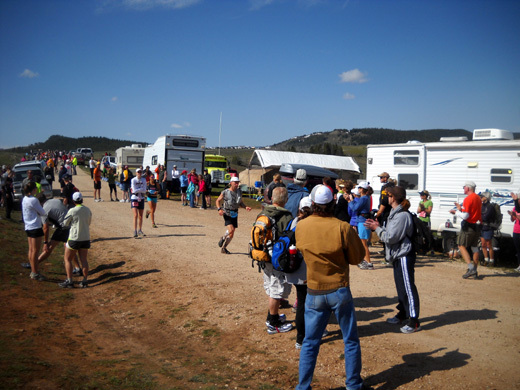 When we got to Dry Fork the first bus turned into the parking area at the top of the hill about a quarter mile from the start. This is not a parking area large enough to accommodate five school buses turning around amid all the other vehicles that were already there. 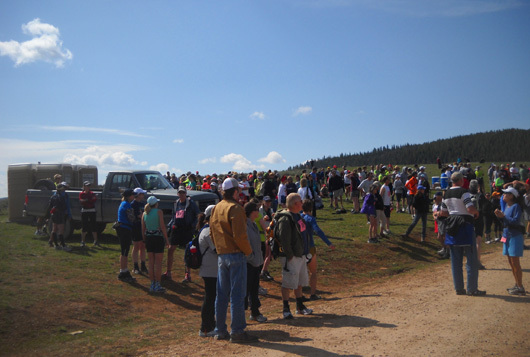 I could see us having to wait for each bus to enter the parking area, let dozens of runners out, get turned around somehow, and leave on the very narrow dirt road where the remaining buses were sitting. It would have taken forever if we'd all waited our turn to get out in the parking area, especially since Anne, Jim, and I were in the fourth bus. 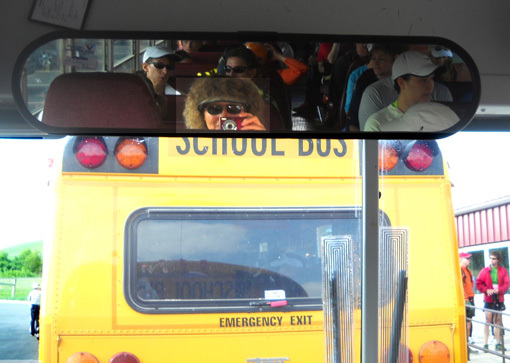 The other bus drivers in front of us didn't know seem to know what to do even though some of them had been up here earlier to let off 50-mile and 50K runners. 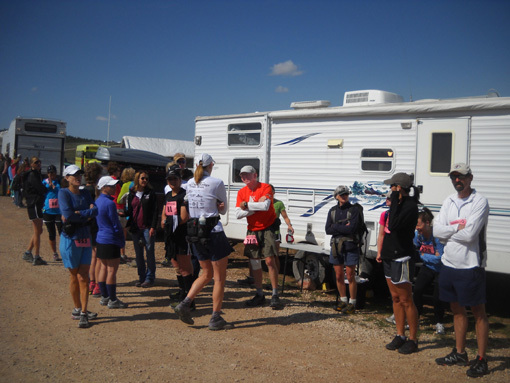 They'd been told not to go down to the aid station because of the 100-milers on the road and the general chaos in that aid station this year. There was even less room down there to turn around. So buses #2, 3, 4, and 5 sat in the road, doors closed, antsy runners all inside. 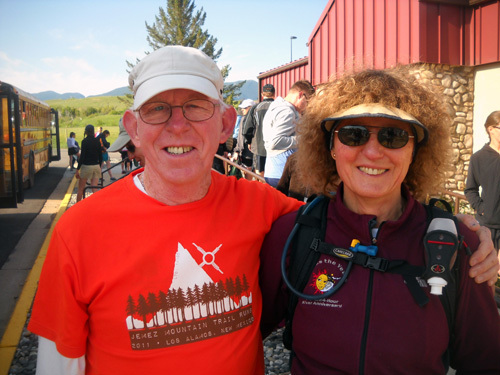 Anne and Jim look relaxed and happy before our race began at Dry Fork. I'm not shy. I'm not very patient, either. Not only did I need to go to the bathroom by then, it also seemed pretty stupid for runners in four of the buses to just be sitting there when the race was supposed to start in 10-15 minutes. So after about 10 seconds assessing the situation, I politely asked Dan, our bus driver, if he could please let us off right where we were. I figured correctly that if he let us out, the other drivers would see the light and let their passengers out, too. Lo and behold, Dan opened the door and we were among the first runners from the buses to check in and/or get in line for the potties! The other bus drivers did the same, but not as fast. 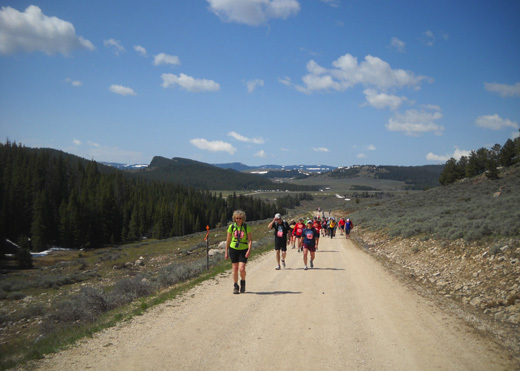 Early release: walking down the road toward the Dry Fork AS, where our race began. If I hadn't said something, someone else probably would have spoken up pretty soon (like Anne or Jim!). I wasn't trying to "cheat" and it wasn't only about me. It just made sense. The 30K was supposed to start at 10 AM but since the buses got us up there late, it took until 10:30 to get everyone checked in and allow time for (most) everyone to go to the bathroom. Times were adjusted accordingly at the end of the race. We got to watch some of the 100-milers and 50Kers come and go through the aid station while we were waiting (photo above and next one below). We witnessed some of that extra determination for which good ultra runners are renowned. Dennis Aslett, for example, was having problems with asthma but doggedly finished the 100-mile race. Davy Crockett broke his right hand at 30 miles. That didn't stop him! He got it bandaged up and kept going another 70 miles. He finished the race with his son Kevin, who was in the 50K and caught up to him. Many of the faster 50K runners and 50-milers (but not so many 100-milers) passed Jim and me while we were on the course. Matt hadn't come back to Dry Fork for the final time when we started the 30K at 10:30. Anne knew he was somewhere on the out-and-back section to Twin Buttes. She waited for about an hour for Matt to return to Dry Fork, then ran the last 30K with him to the finish. 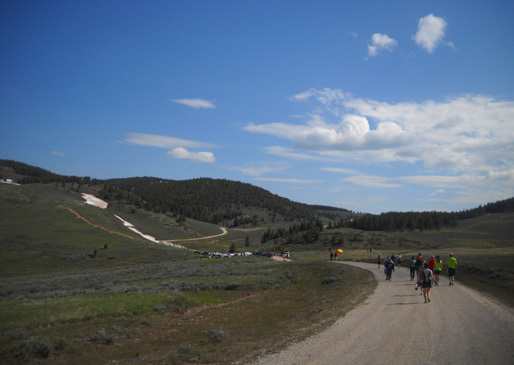 The 30K course begins at the HEAD OF THE DRY FORK aid station [elev. 7,650 feet] and proceeds up the Freeze Out Road, following trails and a gravel road cresting on Camp Creek Ridge at 8,100 feet. 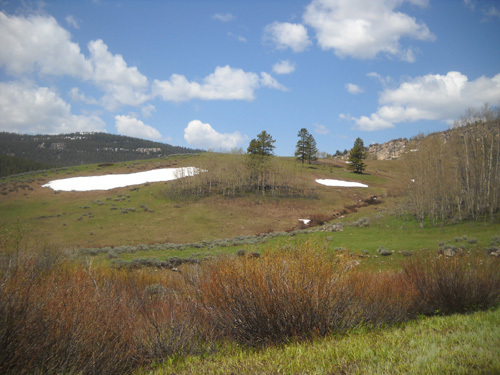 It then descends down Sheep Creek drainage to 7,300 feet on a four-wheel drive road. 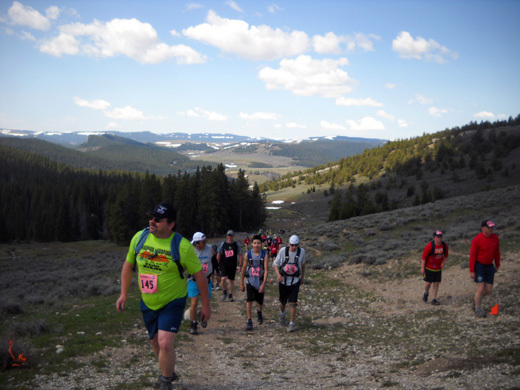 At about 4 1/2 miles you will reach the fully supplied UPPER SHEEP CREEK aid station. 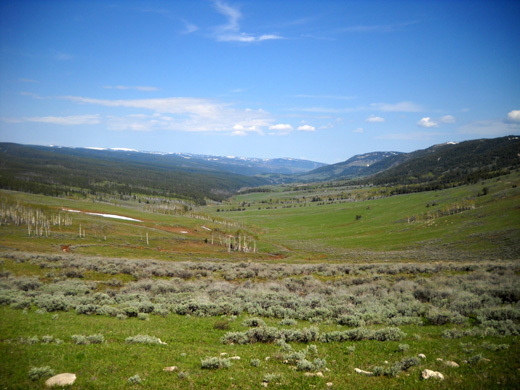 Next is the summit of Horse Creek Ridge at 8,000 feet, following trails and primitive four-wheel drive roads, which will then drop you into Tongue River Canyon. 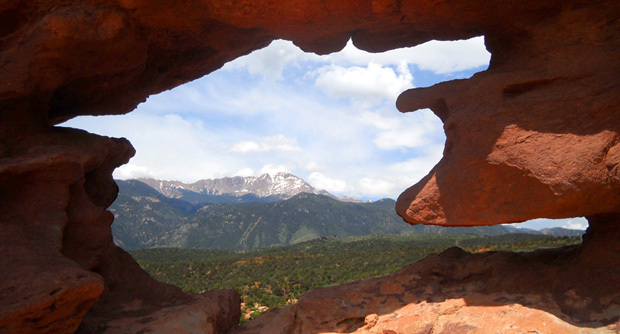 Take a moment to view the canyon and the distant plains before you descend the trail through seas of wildflowers. There are fewer wildflowers on the descent to the canyon this year but the views are still awesome. LOWER SHEEP CREEK aid station at mile 10 and 5,025 feet, is a good place to fill your bottles before entering the sometimes hot canyon below. Continuing on to the TONGUE RIVER aid station at mile 12 1/2 and approximately 4,375 feet you will leave the trail and run on a relatively flat gravel road for the remainder of the distance. At about mile 15 is the final aid station, HOMESTRETCH aid station. Continue on and just as you are entering Dayton you will cross the Tongue River on a rustic footbridge. Runners then cross Highway 14 and proceed into town making a left onto 3rd Street. Go one block and make a left onto Broadway and into Scott Park where the FINISH and picnic gala await you. "Eye of the Needle" rock formation. This is the traditional 30K course, except for the last couple hundred yards at the park in Dayton; this was the only race of the four that didn't have to be rerouted this weekend because of snow. The photos below and on the next three pages are in order as I hiked the course. Jim started the race about two-thirds of the way toward the back. 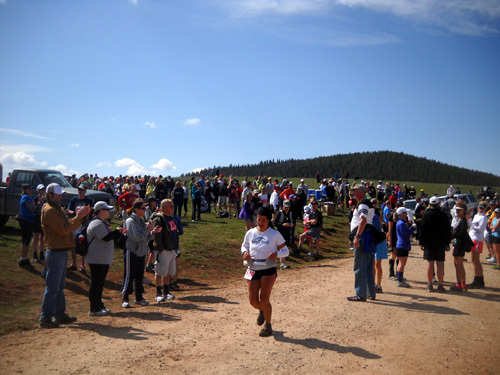 I was near the back of the 300+ runners because I knew I'd be walking most of the race, especially up to the first ridge. So did most of the people around me. As you'll see in the next group of photos, this section of trail was pretty sloppy up the Camp Creek drainage and along the ridge to Upper Sheep Creek! Looking back down through the drainage toward Dry Fork. We're almost to the ridge.